From the aftermath of the Second World War to the present, Varoufakis recounts how the eurozone emerged not as a route to shared prosperity but as a pyramid scheme of debt with countries such as Greece, Ireland, Portugal and Spain at its bottom. Its woeful design ensured that collapse would be inevitable and catastrophic. But since the hurricane landed, Europe's leaders have chosen a cocktail of more debt and harsh austerity rather than reform, ensuring that the weakest citizens of the weakest nations pay the price for the bankers' mistakes while doing nothing to prevent the next collapse. Instead, the principle of the greatest austerity for those suffering the greatest recessions has led to a resurgence of racist extremism. Once more Europe is a potent threat to global stability. Loved it. Eye opener and hard hitting account of the euro zone crisis. A must read. After the the 2008 crash and ensuing Euro crisis so much has been extolled by the media and politicians that it has been hard to know where to start at looking at what has happened and why it has happened. Yanis dissects the problem simply and concisely, explaining in simple terms a very complicated problem. He gets to the heart of the issue of the disintegration of democracy in Europe, pointing out the key players without dictating a personal bias. He also gives an alternative view to the status quo. So overall I feel this is important book for anyone interested in politics or economics of the current era. I look forward to reading his other book The Global Minotaur and hope to see more of his work in the future. Dieses Hörbuch vom ehemaligen griechischen Finanzminister ist schwer zu ertragen. Weil es bis ins kleinste Detail erklärt was aus der "europäischen Idee" geworden ist: Eine Diktatur der Finanz- und Politikeliten die keinem demokratischen Prozess mehr unterliegen und ihre Politik auf fanatischen Glauben errichten. Ich schäme mich für Herrn Schäuble und mein Land. 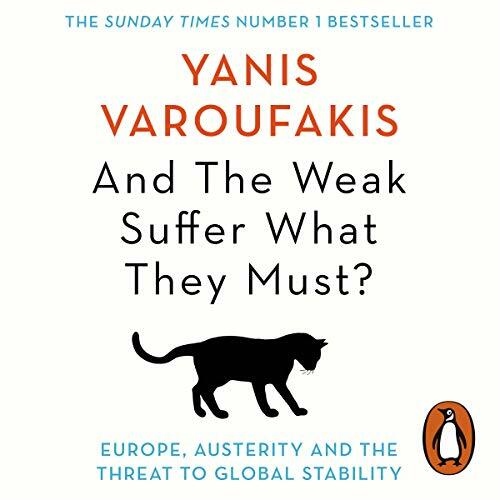 Yanis Varoufakis engages in a captivating story about the development of the current economic system and power relations in europe from the second world war onwards. He outlines in detail the most detrimental problems the EU is facing today. Would have given 5 stars if it hadn't got a bit repetitive towards the end.